As urban planning moves from a centralized, top-down approach to a decentralized, bottom-up perspective, our conception of urban systems is changing. In Cities and Complexity, Michael Batty offers a comprehensive view of urban dynamics in the context of complexity theory, presenting models that demonstrate how complexity theory canembrace a myriad of processes and elements that combine into organic wholes. He argues that bottom-up processes — in which the outcomes are always uncertain — can combine with new forms of geometry associated with fractal patterns and chaotic dynamics to provide theories that are applicable to highly complex systems such as cities. 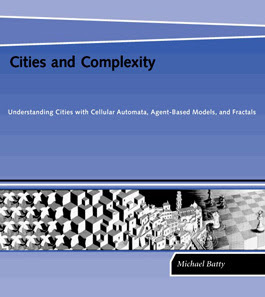 Written by Michael Batty, he begins with models based on cellular automata (CA), simulating urban dynamics through the local actions of automata. He then introduces agent-based models (ABM), in which agents are mobile and move between locations. These models relate to many scales, from the scale of the street to patterns and structure at the scale of the urban region. Finally, Batty develops applications of all these models to specific urban situations, discussing concepts of criticality, threshold, surprise, novelty, and phase transition in the context of spatial developments. Every theory and model presented in the book is developed through examples that range from the simplified and hypothetical to the actual. Deploying extensive visual, mathematical, and textual material, Cities and Complexity will be read both by urban researchers and by complexity theorists with an interest in new kinds of computational models. As William J. Mitchell states Batty provides a powerful new way of thinking about cities in terms of cells and agents, demonstrating how highly organised spatial patterns can emerge from surprisingly simple simple rules and processes. The reviews of the book have been glowing, for example – “Batty is a master at presenting challenging material in ‘gentle though rigorous’ ways, judiciously combining text, graphics, and notation, and moving from easy-to-grasp toy problems to real examples.” from Helen Couclelis, Professor, Department of Geography, University of California, Santa Barbara. Professor Michael Batty’s Cities and Complexity is our current recommended read at digital urban. You can purchase it, currently at discount, via our associate store at Amazon – let us know if your reading it via the email link on our side bar. Michael Batty is head of our lab at CASA, you can view more of his work via CASA’s main site.